An article on today's Daily Telegraph website tells us that scientists doing proper science have, at last, found the true causes of global warming. It's - er, well - it's the sun. Now that's an inconvenient truth! Some of us have long thought that anthropogenic global warming, while containing an admirable number of syllables for only three words, is a myth. 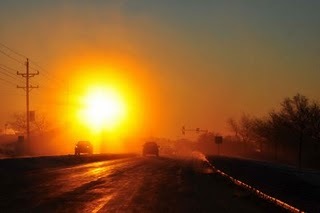 The problem is - living in the UK, we're not sure the sun exists, either. PS Photo courtesy of Stephen Baird - follow the link for some awesome pics. O! What a marvelous society! 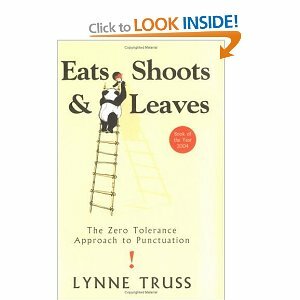 This morning I was proof reading my latest little booklet (to be anounced here soon) and so, naturally, I began re-reading the classic 'Eats, shoots and leaves' by Lynne Truss. Very good, it is, for a middle-aged old pedant like me. I hadn't registered, first time around, that there is a society (O! marvelous society!) called 'The apostrophe protection society' - but there is! Quick, where do I join? Now, I'm not quick to judge. Heaven forfend. It may just be a typo. And even if it isn't, I wouldn't say that anyone who thought that "pastor's" is the plural of "pastor" ought not to be in the ministry, entrusted with the sacred charge of edifying others. I wouldn't. Quite. (Oh, all right - I probably would.) But come on now - READ THE BOOK. I want a man who knows what love is all about. You are generous, kind, thoughtful. People who are not like you admit to being useless and inferior. You have ruined me for other men. I yearn for you. I have no feelings whatsoever when we're apart. I can be forever happy - will you let me be yours? I want a man who knows what love is. All about you are generous, kind, thoughtful people, who are not like you. Admit to being useless and inferior. You have ruined me. For other men I yearn! For you, I have no feelings whatsoever. When we're apart I can be forever happy. Will you let me be? All the words are the same; but punctuation matters - doesn't it? It’s been a long time, but I’ll try to get back to blogging this week; there are several things I want to say. To get going, we’ll give the Monday humour a miss, and instead include this for a Sunday. I’ve recently returned from the Aber conference – not to be confused with an Abba conference – and was greatly blessed by the ministry of Geoff Thomas. Here’s an interview with him, done a few years ago.